We have transitioned the old X250/X50 loggers into one product using a digital 3-axis 200g accelerometer sensor. The sensor provides excellent low-noise and low power capabilities that is best suited for applications involving events that exceed capabilities of the X16 series products. The small compact device captures impact events with precise timing and records the data to the internal flash memory. The plain text comma separated data files are easily accessible via the USB mass storage device interface. Read more about our data logger product-line features. For more details, specification and how to use the X200-4, please look at the product user manual(.pdf). 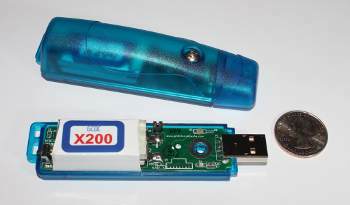 Click to download an example data file from the X200-4 logger.